Mandarin Facial Toner is a highly effective, yet gentle skin-balancing tool. It utilizes the combination of mandarin orange extract and witch hazel to take combination and oily skin to the perfect skin pH of 5.5. 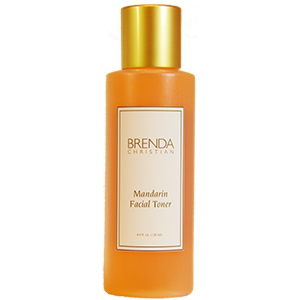 Mandarin Facial Toner acts as a very gentle exfoliant by utilizing Alpha Hydroxy Acid to lift away dry skin cells, and clear blocked pores which cause skin to appear sluggish. Remove last traces of Herbal Cleansing Milk by saturating a 100% cotton pad with Mandarin Facial Toner. Sweep upward and outward over entire face and neck. Naturally removes dead, dry skin cells which when combined with sebum, block the pore openings encouraging skin problems. A refreshing, natural herb with astringent properties and surface cell hydration. Lemon Balm is a natural healing agent that aids in reducing any red, blotchy skin appearance. Tightens pores, softens rough skin, refreshes and moisturizes. Purified Water, Hamamelis Virginiana (Witch Hazel) Distillate, Carica Papaya Fruit Extract, Glycerin, Propylene Glycol, Polysorbate 80, Aloe Barbadensis Leaf Juice, Salvia Officinalis (Sage) Extract, Epilobium Angustifolium (Willow herb) Extract, PPG-20 Methyl Glucose Ether, Achillea Millefolium (Yarrow) Extract, Tetrasodium EDTA, Hydrastis Canadensis (Golden Seal) Extract, Diazolidinyl Urea, Panax Ginseng Extract, Symphytum Officinale (Comfrey) Leaf Extract, Polysorbate 20, Althea Officinalis (Marshmallow) Extract Rosmarinus Officinalis (Rosemary) Extract, Lactic Acid, Cucumis Sativus (Cucumber) Extract, Juniperus Communis Fruit Extract, Benzalkonium Chloride, Butylene Glycol, Commiphora Myrrha (Myrrh) Extract, Methylparaben, Anthemis Nobilis (Chamomile) Extract, Triticum Vulgare (Wheat) Germ Extract, Propylparaben, Fragrance, Yellow 6, Red 40.